I’ve been learning Chinese for almost four years now (a few more months to go). I still discover interesting things about Mandarin everyday. I remember back in 1st year of Chinese, we went through the Pinyin chart of syllables, getting the grips of Chinese pronunciation. Syllable after syllable we went: bo, po, mo, fo etc etc. 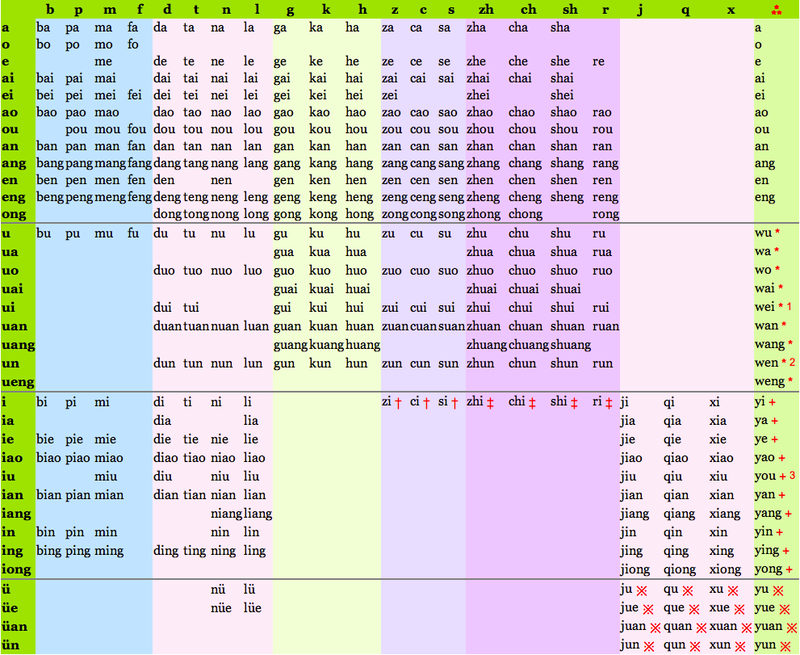 Little did I know that now three years later I’m still finding some oddities in these syllable charts and Pinyin too. Zero initials are finals that act as the only form of the word, therefore an initial. Like en or ao for example. Look at the last column going down. You'll see it in action from the second grouping onwards. U for example is replaced by W. So words like 我 (wo) can actually exist as uo. But some more interesting things are afoot. 2) Wei, wen & you are actually abbreviations. Yeah, I did a complete double take on this. Now this is a bit confusing. Let me explain. Ui, un & iu are actually uei, uen & iou respectively. The IPA (International Pronunciation Alphabet) also shows this in its pronunciation, for example of ui is [u̯eɪ̯]. Now. Notice how pronouncing wei and and dui both end in the same sound. This is because they do: duei and uei. However, notice that uei is written as wei? See number 1. The W replaces the U. Now why they changed duei into dui is a mystery. Same happens with dun and wen: duen and uen. If you are confused you are allowed to be. No hold on. Why did I not know this before!? This one bowls me over. Look at the bottom rows. See there on the right, there are no ü! WTF. The reason why I had to look up the syllable table again, was due to the word 战略, pronounced as Zhànlüè, which means strategy. I didn’t know how to pronounce lüè as it was a bit tricky for me. Never seen it before. When I found the table, I realized it ends the same as 月. Hot damn. Actually the other day I wondered, why does the endings of wo and duo sound the same? Luckily I answered my question today. The same can be said for instance in the endings of you and niu. This comes from the second point, where they are actually the same sounds, but written differently (along with some weird abbreviations). Now, here’s the discussion. Why is Hanyu Pinyin written this way? Why are there these inconsistencies? I’ve always thought that Pinyin is a bit strange. Somehow it’s just not there for me. I asked my brother to write down 不知道 in English. In Pinyin it is bù zhīdào. He wrote it as: boo tsjedao. Although this is an indication that Pinyin is not there on first use, it begs the question, is using a romanized script really such a good choice for presenting Mandarin sounds? I’m gonna ask some more friends to write down how they think Mandarin sounds in Chinese to test it. But I think the way you perceive a roman script is based on your language. For instance, a Spanish speaker who write it differently to an English speaker. It make more sense this way. At least to me.